The AIB 2019 meeting will take place at the campus of Copenhagen Business School. Primary meeting rooms will be in Solbjerg Plads with some events in Kilen-Kilevej. Metro: Take the M1 or M2 metro to Frederiksberg stop. CBS (Solbjerg Plads) is right outside of the metro station. Bus: Take bus 34 to Nyelandsvej Skole, or take bus 9A or 31 to Fredirksberg Bredegade. CBS is less than 5 minutes walk from either stop. Book your accommodations for AIB 2019 today in order to ensure you stay with other AIB participants and to benefit from preferred rates. HelmsBriscoe is the official booking service for the AIB 2019 Conference. Booking through AIB's official booking service allows us to provide you with special negotiated rates and dedicated customer service. Please note that all rates are inclusive of wifi and VAT, and most hotels (except for Axel Guldsmeden) include breakfast in the quoted rates as well. Copenhagen is a walker and biker friendly city with an extremely strong public transportation system. 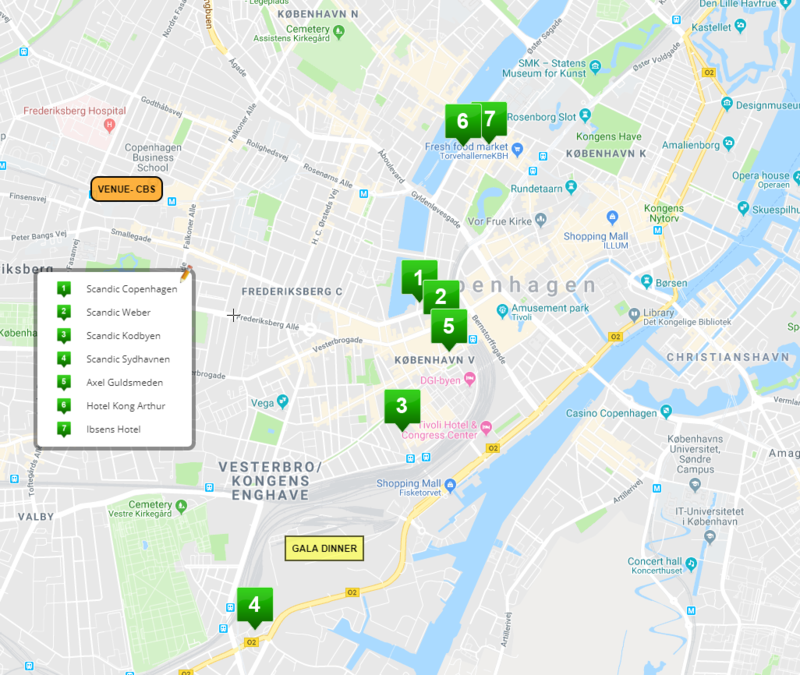 All hotels are within easy reach of the conference venue (CBS), the Gala Dinner location, and various Copenhagen attractions. NOTE: The only official correspondence you will receive will be from AIB or HelmsBriscoe. Any other correspondence or lodging offers you receive will be unsolicited and unauthorized. Do not respond to such offers.